Adobe serves an enormous part of the image-editing market, whether photographers like it or not. They are an industry leader in graphic design, photo editing and photo management software---the standard in the industry for many people. Lightroom, the photo processing software, has professional-grade editing and organizing tools, but still maintains its usability. The Creative Cloud of Lightroom version is part of Adobe’s annual subscription-based Photography Plan, which includes Photoshop CC, so you’re getting two photo-editing applications designed to work alongside each other. Adobe's recent upgrade to Lightroom has seen the emergence of two Lightrooms--Lightroom Classic CC (an updated version of the desktop Lightroom that we know--its Lightroom 7) and Lightroom CC (an entirely redesigned app designed to work alongside Adobe’s equally new cloud-based storage system)--a cut down version (Lightroom Mobile? ), that is a shift to a more mobile-first workflow which allows you to manage your photos wherever you are and whatever the device. The current subscription model for Lightroom CC means that we rent Adobe’s apps rather than buying a licence--permanently renting the tools we use to create. The shift is from software to rental ware. I have been using the stand alone Lightroom 5 (desktop) up to now, but I recently purchased Lightroom 6 (desktop) as part of my film order from B+H. I realize that I am essentially getting a two-year-old version, feature wise, as compared to the subscription version. I appreciate that the differences between the subscription version Lightroom Classic and and the standalone version of Lightroom 6 are becoming significant, but I don't really need all the updates or the extraneous options. I've had little interest in photography as it as been just too wet. I've done little film photography since the start of winter, though I have been scoping with the digital camera. 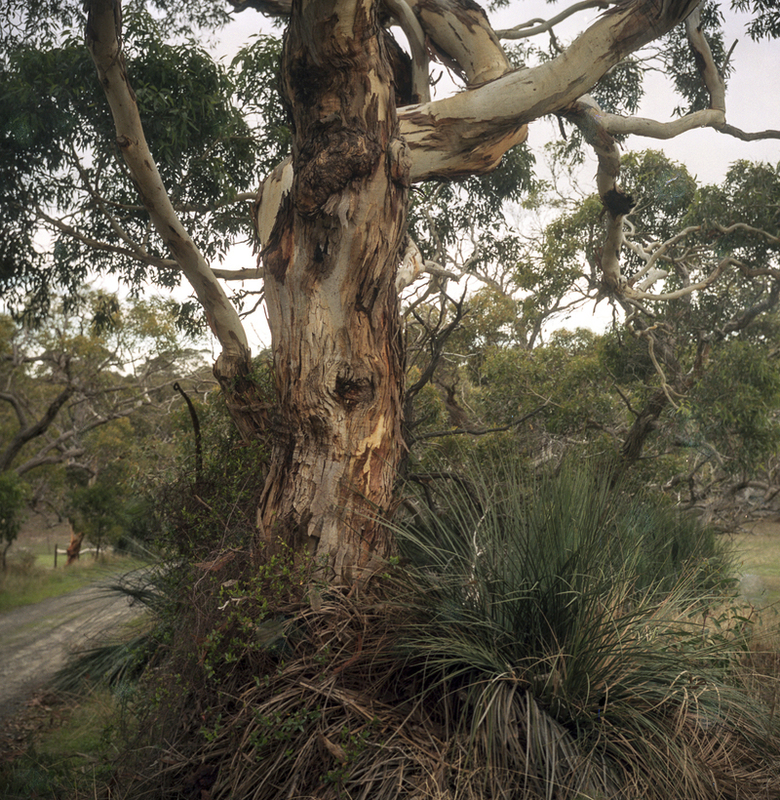 It's been too cold, wet and windy along the coast of the southern Fleurieu Peninsula to use the film cameras. 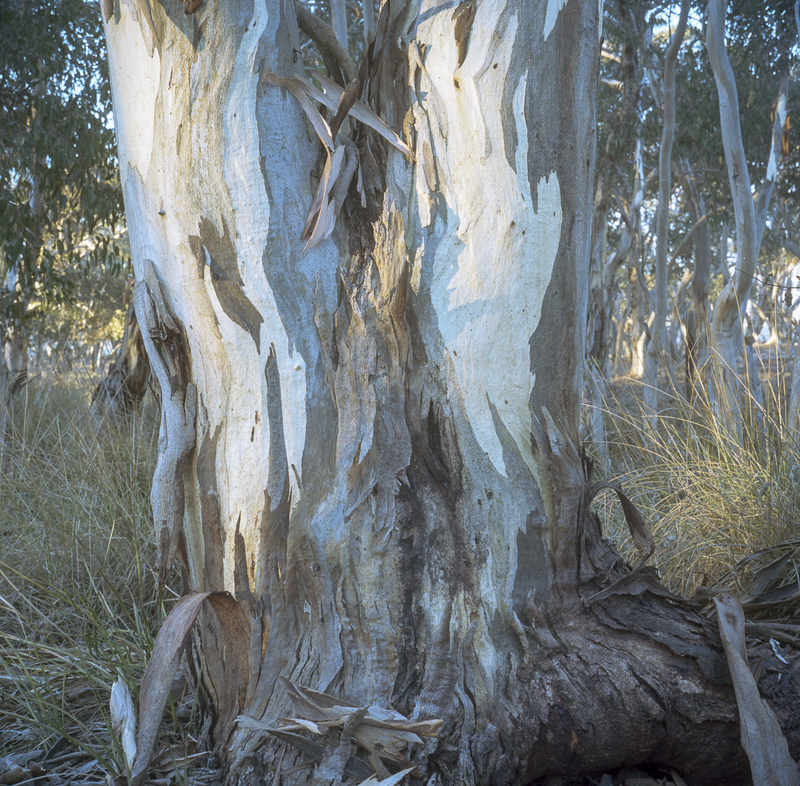 Today was the first time, in fact, that I used a film camera on a tripod since the photoshoot along the Mallee Highway. That re-photographing felt like I was picking up the threads again re film photography after going through a fallow period---it's been about a month since the Mallee Highway photoshoot. 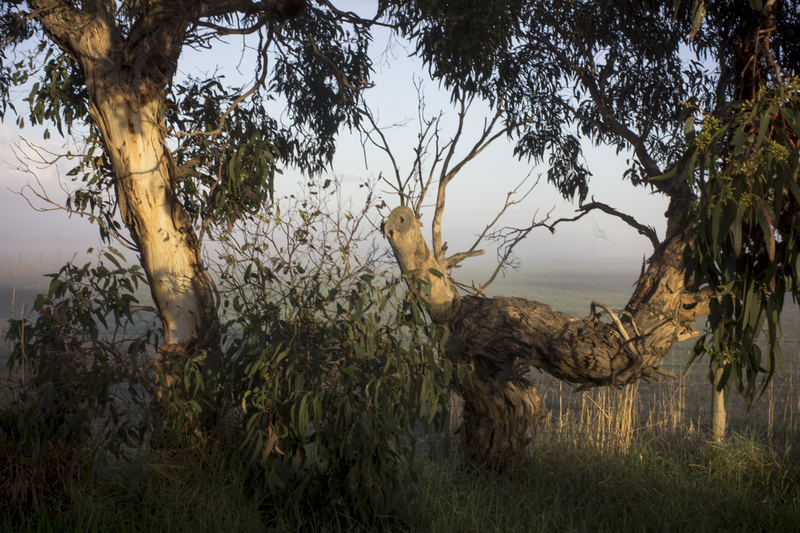 This one was even more planned than the other pictures that I made on Halls Creek Rd:---the time was down to the minute in order to ensure that the early late autumn morning light fell across the twin trunks of the eucalypt. Without that early morning light the picture would have been dull and flat. I would have walked past the scene. 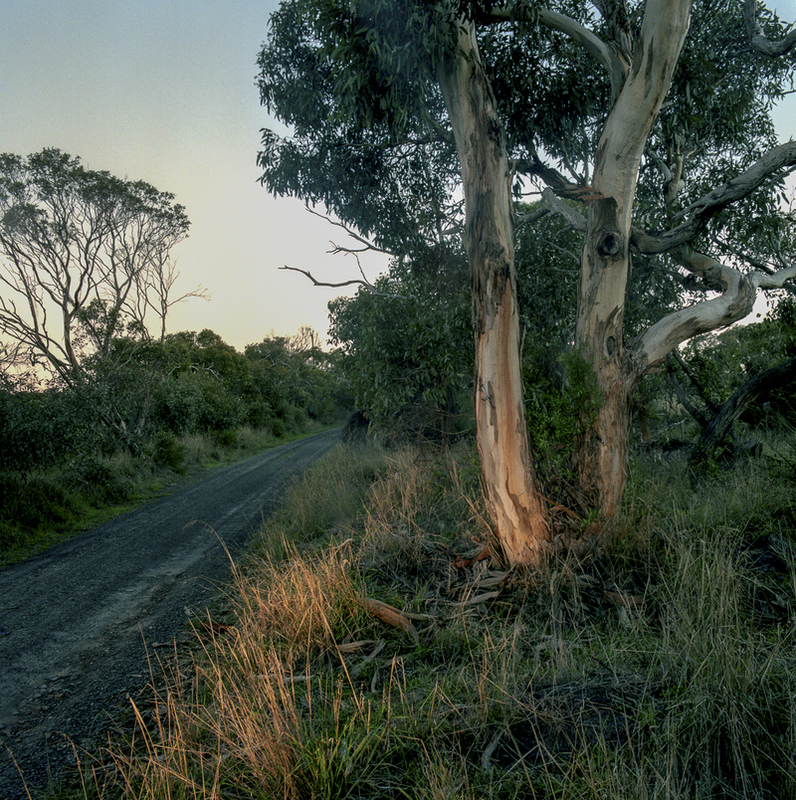 Halls Creek Rd is a part of the Heysen Trail. It runs not south and and it is where I often walk in the evening with the standard poodles. 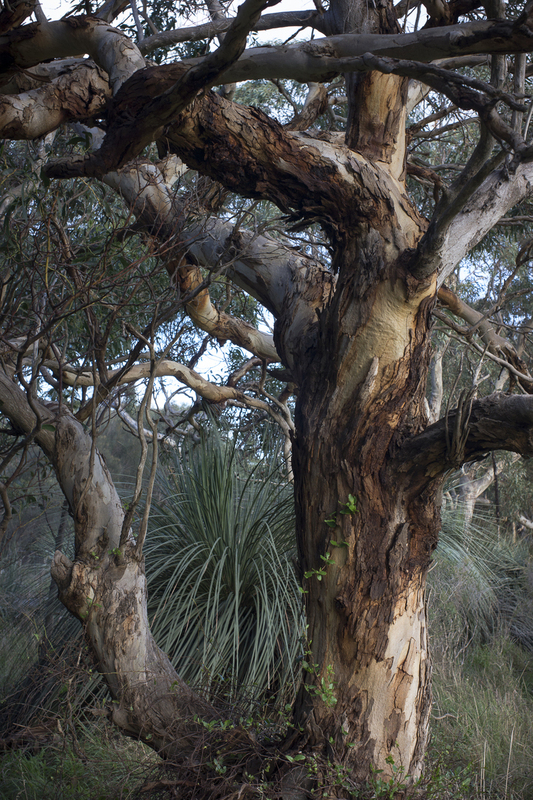 It offers protection from the strong, southern coastal winds and it has lovely afternoon light. This picture was made in the late winter. There are fields where sheep and cattle graze on the western and eastern sides of the road. This, in effect, is a strip of roadside vegetation between farmland. A lot of the spaces on the Fleurieu Peninsula are like this. Most of the land has acquired capital value and has become a commodity. There is no Arcadian natural simplicity that stands in opposition to, and a compensation for, urban life in the postmodern city here. It is the landscape of white settlement. It all looks quite different in late spring as the green grass has dried and it has become a golden brown. It would be a different photo in summer. Late spring, however, is not a good time to walk along back country roads, such as this one with the standard poodles. The dried grass seeds along the side of the road become caught up in the poodle's woolly coats and they are very difficult to get out. Miss one and they spiral their way into the body within 24 hours. 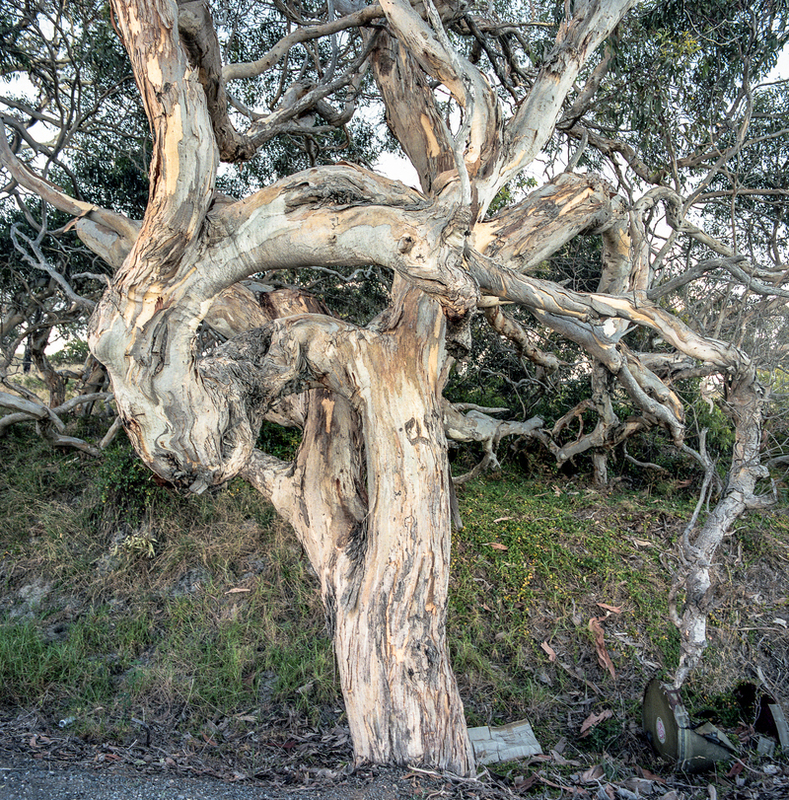 This picture was made one afternoon along Halls Creek Rd in Waitpinga on the Fleurieu Peninsula in South Australia. 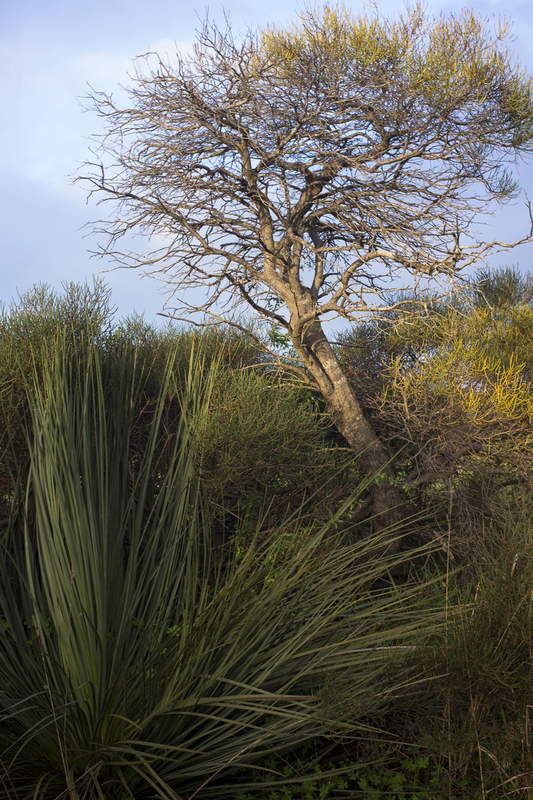 Halls Creek Rd is part of the Heysen Trail, and I often walk along there on a late afternoon poodlewalk in the winter time. It's fenced on both sides of the road, it is protected from the southwesterly winds , and the western sunshine gently lights up the vegetation. On this occasion I exposed some old Portra NC 160 ASA film that had been sitting in the 6x7 film back of the Linhof Tehnika 70 for 5 years or more. I thought that I'd better finish the roll of film and have it developed as I had nothing to lose. Though the negatives were a bit flat and the colours were washed out the digital files were okay when I scanned the film. Some of the pictures looked a bit odd, but I didn't mind. I have finally had the batteries for the Rolleiflex 6006 system repacked by a battery outfit in Thebarton. The previous attempt to repack them in Adelaide was a failure, as the person doing it didn’t know what they were doing. The batteries, though new, would not recharge, and, if I couldn’t find anyone else in Adelaide to repack them, I was faced with sending things back to Rollei in Germany. The 6006 is a bulky 1990s system, but a good one that I use regularly. However, the battery pack is an old fashioned one, and over time it holds less and less charge. Without the batteries the electronic cameras become expensive doorstops. This system had been out of action for six months because I couldn't find anyone to repack the batteries properly. I'm happy that things up and running as it means that I can do more table top pictures in the studio.